Is My £1 Coin A Minting Error? How Much Is My Error One Pound Coin Worth? When Will The Pound Coin Cease To Be Legal Tender? This is our blog, if you are interested in purchasing one pound coins please click this link. The Royal Mint claimed that by using cutting-edge technology, the new 12-sided £1 coin would be the world's most secure coin. Created to combat the growing number of forgeries of the old round pound, we were looking forward to the new pound exceeding our expectations. After all, the pre-launch campaign of videos and press releases featured lots of details of the design and security features of the new coin; it looked amazing. 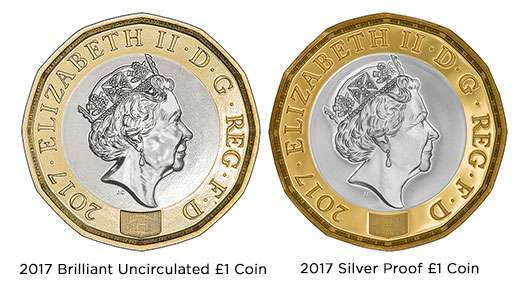 However, since the release date of the new £1 coins, we have had an abundance of enquiries about possible errors on the coins. As with any new currency, people want to know if there are any coins that are worth more than their face value. Interest in error coins is growing and collectors will often pay higher sums for these coins. Some of the £1 coins which are appearing in change are disappointing. The finish is rather shoddy and it is quite normal for coins from minty bags to be full of scratches and bag marks. It is important to understand that the 12 sided £1 circulation coin is only struck once. This results in a coin with low definition when compared with the brilliant uncirculated coins which are struck twice or proof coins which can be struck up to six times during the minting process. 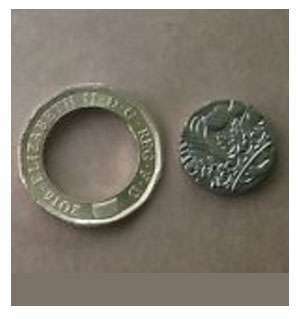 However, when you compare the new £1 coins to a round pound, eg. 2015 Royal Arms £1 which is also only struck once, you cannot help but notice that the new coins do not look as sharp as the old coins. With over 500 coins being struck a minute and the huge rush to meet demand, imperfect coins which should have been picked up during quality control have been released into circulation. It is not uncommon for striking mishaps to occur, especially when so many coins are being issued to a tight deadline. Coinage dies can become damaged during long runs which can cause abnormalities on the coins. Usually dies are withdrawn and replaced when damaged coins are noticed. Once the metal alloy for the new £1 coins is melted in the furnace, it is extracted as long strips. The strips are cut into lengths which are then fed through rolling mills until it is reduced to the thickness of the coin. A blanking press then punches out discs of metal, called blanks, from the long strip. This blank is then fed into another blanking press where a disc is punched out of the centre to create the outer ring. 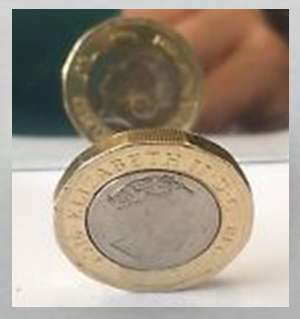 A separate blank is produced in a similar way to make the inner blank for the centre of the coin. These blanks are heated, cleaned and smoothed before they are immersed in electroplating solutions so that they are ready to be stamped with the engraved design. The inner core blank is fractionally smaller than the hole of the the outer ring and is either scored around the edge or has a slightly bevelled edge. For previous bi-metallic coins, the outer ring blank and the inner core blank are fed through into a coin press to be stamped with the engraving on the obverse and reverse. As the coin is struck, the pressure forms a bond between the two parts of the coin to make a whole. 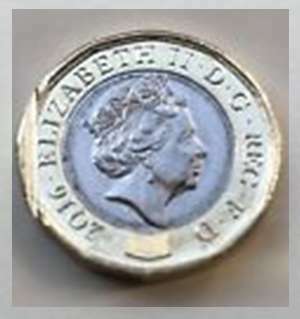 Now, we had assumed that the production process for the new docedecagonal pounds was the same. That both the inner and outer blanks were then fed into the coining press containing two steel dies, one for the obverse engraving and the other for the reverse engraving. A quick look at ebay reveals a large quantity of damaged £1 coins for sale. 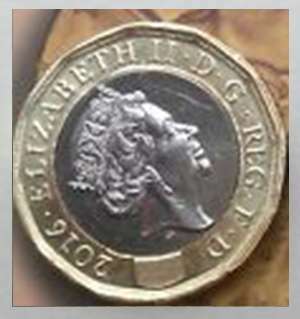 Examining the photos of error coins appears to show that the new pound coins are not struck using the "normal" previous bimetallic coin production method. We have applied some detective work and logic, to try and work out the exact production method and sequence. "The striking process is robust, well-established and subject to high standards of quality assurance. Therefore, in observing a number of coins with separated and reversed inners and outers for sale on online auction sites, our belief is that these have been deliberately manipulated. We are reminding people that breaking up a UK coin is illegal under the Coinage Act 1971." We would be interested to hear if you have found a one pound coin that has separate components - but not if you have deliberatley 'broken' the coin..
Error A, shows that the two blanks of the coin are struck as separate elements before bonding the blanks together. Inner core blanks can become misaligned during the bonding process. This could happen spontateously for some reason or may be due to later interference; people may be deliberately faking errors to sell to collectors. Error B, or has the incorrect combinations of an obverse engraved outer ring with a reverse engraved inner core and vice versa, Error C and Error D shows an unengraved inner blank paired with an engraved outer blank. It is not uncommon that striking errors exist on bi-metallic coins. Occasionally, the inner blank is damaged. If a distorted inner disc is fed through the press, whether due to being improperly inserted, faulty equipment or inattentive employees a gap can occur when the inner and outer blanks are bonded. 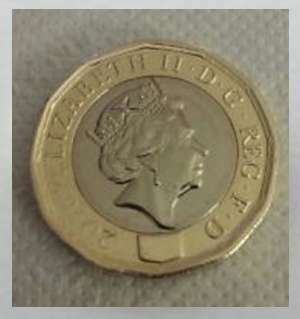 You can see an example of this in Error E.
There will be many coin dies prepared for the new one pound coins. With the force and repetition of striking it is inevitable that the dies become worn and damaged. Tiny fragments of foreign material can become attached to the blank or the dies, the dies beome worn in higher point areas or simply spoiled during production. Elements can be missed off some dies, or dies may have a flaw such as a die crack. These dies should have been destroyed before use. You can see examples of where the latent hologram is absent from the lined shield on Error F.
With regard to the micro engraving, we have had a close inspection of the coins in our possession. Occasionally the lettering looks as though it is damaged or is missing. 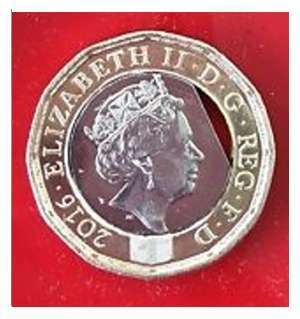 The lettering is tiny and when the coins are struck, the impression made is nothing like the images of the coin that are seen in promotional literature from The Royal Mint. On those illustrations the lettering is sharp and easily visible. Under a loupe or magnifying glass it looks very soft. It does look sharper on the proof coins but it is a far cry from the vision of the new coins. We think one of the more exciting errors is the mule, Error G. A mule is when a coin is struck from two dies which have been paired incorrectly. This example shows that the inner blank has been struck with two obverse dies with Elizabeth II's fifth definitive UK coin portrait by Jody Clark. We feel that example Error H has occured when the die has been damaged pre-production. This die should have been scrapped prior to striking coins. We have received many enquiries asking whether the 2016 new £1 coin is worth a small fortune. Why? Well because you would expect a coin issued into circulation in 2017 to bear the date 2017. So surely this is a minting error after all The Royal Mint are known to make minting errors (remember the infamous undated 20 pence?). The public were probably right to assume it was an error, but unfortunately, with 500,000,000 dated 2016 (and most probably half them sitting in our safes), it certainly is not an error or worth more than face value. If anything, the 2017 dated coin is less common at the moment, at least in our area. We have only ever seen them in the annual coin sets. Read our blog 2016 Twelve Sided New £1 Pound Coin? to find out more. Here are some of the questions that we have been asked about minting errors. "hello i saw on facebook that my new pound coin could be worth more as i have one that has a changing hologram that changes between £ and 1 .could u advis" - This is correct, the hologram should change from a £ to 1 when tilted. "Hi there, I have two 2016 new pound coins, I know the year is of not much importance but there are some differences between the two of them and I wondered if one of them may have been a "trial" coin. The dye of the silver part goes darker towards the edge on both. One coin has a very rough outline of the queen which is almost jagged, on the back I have noticed that the silver cuts through the palm tree piece before the other coin does, which also results in it going through the thistle slightly before it should." - Have a look at our blog about the trial piece coin, it looks very different from the 2016 twelve sided £1 coin. We think that in addition to the official trial coins, bags of the 2016 coin were probably distributed to businesses and organisations that handled money or needed to recalibrate equipment prior to the introduction of the new coin. We love hearing about different minting and striking errors, so please keep letting us know but unfortunately you may not be able to retire on its worth. We would advise finding a collector who only collects error coins but remember most of them are not unusual and so do not carry a hefty price tag. Error £1 Coins or Fake £1 Coins? We are not saying error coins are worthless, (remember every coin is worth something). With so many coins being minted there are bound to be errors made. However, when large number of errors in coinage occur, concerns are raised about the security and veracity of the coinage. When the striking of the circulation coins is poor quality people are concerned as to whether they have a genuine coin or not. 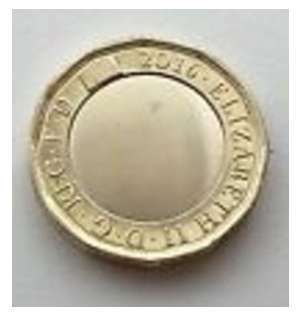 The new pound coin was available to purchase online for months in advance of the introduction on 28 March 2017. Either in the 2017 Annual Coin Set or loose. This would have given forgers plenty of time to create a lookalike coin. After all, the launch of the new £1 coin would have been the perfect time for counterfeiters to flood the market with fake coins, most people would have been none the wiser. 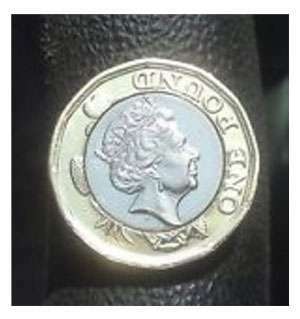 Maybe The Royal Mint needs to explain exactly how you can be sure that your pound coin is real or fake. The round pound coins issued between 1983 to 2015* will cease to be legal tender on 15 October 2017. Once they have been demonetised, you will need to exchange them at the Bank of England in person or by post. * The 2016 one pound coin was only issued as a commemorative coin. It was not released for circulation.